The latest Scholar Athlete of the Week is an outstanding student who heads his school’s online magazine and rises above disability on the track team. Jeffrey Grinberg is more than a student at Francis Lewis High School. His teachers and classmates call him an inspiration. Grinberg was born three months premature, and certain antibiotics he was given as a baby resulted in severe hearing loss. “I wasn’t technically diagnosed with it until I was five and I was in kindergarten and teachers were starting say, ‘oh, this guy’s a rebel, he’s not listening to any of my directions,’” says Jeffrey. But he’s anything but a rebel. He doesn’t use his disability as an excuse. Instead, his teachers say he just works harder than nearly anyone else. He’s an outstanding student with an A+ average. “You don’t see disability when you look at Jeffrey. That’s the last thing that you see. You see determination, you see ability, you see goals being set, goals being met,” says Isai Serrano, Jeffrey’s Virtual Enterprise teacher. Jeffrey’s hard work is most evident in that Virtual Enterprise class, where he’s CEO of the online magazine created with his fellow students. Perhaps his most endearing quality is his willingness to help others at any time. Whether it’s his track teammates or a random student, his teachers say he offers academic and other kinds of advice. “You know, it just feels nice. It makes me happy, happy to see other people happy, you know, it’s a great thing, a good feeling,” says Jeffrey. Jeffrey is setting his sights high when it comes to college. He’s applying to some of the best in the country. He plans to study either computer engineering or business and has all the confidence in the world that he’ll be successful. “Just because I have a disability didn’t stop me from doing what I want to do—following my dream, get where I want to get,” says Jeffrey. 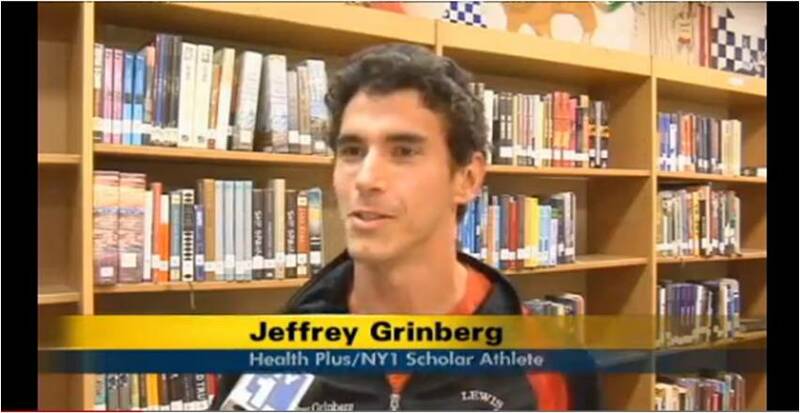 For overcoming adversity and embracing the challenges along the way, Jeffrey Grinberg is the latest Health Plus/NY1 Scholar Athlete of the Week.